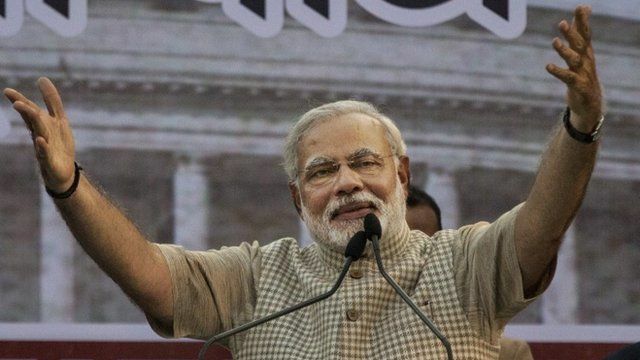 Modi: 'This is no ordinary victory' Jump to media player Narendra Modi is on course to become India's next prime minister as polls predict a resounding victory for his BJP party. India opposition heads for landslide Jump to media player The opposition Hindu nationalist Bharatiya Janata Party (BJP) has called its predicted landslide win in India's election a "people's victory". Indian elections: Two-minute guide Jump to media player BBC News tells you all you need to know about India's 2014 general election - in just two minutes. 'Great excitement' at stock exchange Jump to media player India's governing Congress party has admitted defeat by the main opposition BJP, as results come in from the general election. BJP president: 'The people's victory' Jump to media player The opposition Hindu nationalist Bharatiya Janata Party (BJP) is on course for a landslide victory in the Indian elections. Congress admits India poll defeat Jump to media player India's governing Congress party has admitted defeat as early election results give a strong lead to the main opposition BJP. Narendra Modi is on course to become India's next prime minister, as his Bharatiya Janata Party (BJP) heads for a resounding victory. The ruling Congress party have conceded defeat after 10 years of rule, and a final result is expected later on Friday. Speaking at a rally Mr Modi told his supporters: "We have to take India forward... we have to fulfil the dreams of more than a billion people."